In the Russian Church, we won't have any other choice but to break communion with Constantinople. It means that the Patriarch of Constantinople will no longer have a right to be called the head of 300 million Orthodox Christians. It's been a while since we heard such strong words from the Russian Orthodox Church. let alone addressed to Patriarch Bartholomew of Constantinople, whose "brazen and cynical decision" put him "on the warpath" and who is executing a "cunning plan." These are the words the Russian Orthodox Church used to make an official statement on the decision of Patriarch Bartholomew of Constantinople to grant autocephaly to the schismatic Ukrainian Orthodox Church, led by self-avowed Patriarch Filaret who, by the way, is under anathema. The decision has been made public last week in Istanbul when Patriarch Bartholomew gathered all his bishops together for a council, or synaxis. It is now clear that Bartholomew is going to issue a tomos (solemn church edict that includes the words 'by the grace of God' and so on) that will legitimize the Ukrainian schismatics. For Ukraine, it means even more misery - the horror of a religious war with inevitable bloodshed and real battles for temples and monasteries. For Eastern Orthodoxy with its 300 million people, this is the biggest schism in history. The Patriarch of Constantinople lives in Istanbul and wears jeans in his everyday life. His congregation is much smaller than that of the patriarchs of other autocephalous Orthodox churches. The US lends the patriarch political and other support. Global Orthodoxy has a network structure. Orthodox Christians, unlike Catholics with their pope, don't have a global leader. The spiritual head of the church is Christ. But traditionally, the patriarch of Constantinople is regarded as the first in honour. Though it doesn't give him any administrative right over his other colleagues and canonical territories. The decision to grant Ukrainian schismatics legal autonomy is an excess of authority, administratively, and heresy, spiritually. So the response of the Russian Orthodox Church is quite understandable: "This decision was made without consulting Patriarch Kirill of Moscow and All Russia and Metropolitan Onufry of Kiev and all Ukraine and is a blatant violation of the canon law which does not allow bishops of one autocephalous church to interfere in the life and proceedings of another autocephalous church, as per canon 2 of the Second Ecumenical Council, canon 20 of the Council of Trullo, canon 13 of the Council of Antioch, canons 3, 11 and 12 of the Council of Serdica. It goes against the hitherto unchanging position of the Patriarchate of Constantinople and personally Patriarch Bartholomew who on many occasions recognized His Beatitude Metropolitan Onufry as the only canonical head of the Orthodox Church in Ukraine." Be that as it may, Patriarch Bartholomew of Constantinople has already announced that he is sending to Ukraine his two special representatives, exarchs. One of them is from the US, the other one from Canada. Their objective is to complete the formation of a new autonomous church in Ukraine. The strong-worded statement of the Russian Orthodox Church is the last attempt to prevent a new Great Schism. According to Metropolitan Hilarion, it exhausts church diplomacy. A personal meeting of Patriarchs Kirill and Bartholomew took place in Istanbul not so long ago, on August 31. The Primate of the Russian Orthodox Church said they had talked like brothers. There were no other, more elaborate comments, and now this. To comprehend the importance of these events, it should be known that the canonical and recognized by everyone Ukrainian Church of the Moscow Patriarchate, that didn't ask for any autonomy, since it enjoys autonomy already, has more than 12,000 parishes and 200 monasteries, including three lavras: Kiev Pechersk Lavra, Pochayiv Lavra and Holy Mountains Lavra. The schismatics, however, who demand legal autonomy through the oligarch president Poroshenko, have no lavras and an order of magnitude fewer parishes and monasteries. The schismatic church of the so-called Kiev Patriarchate separated from the mother church in 1992. That's why in 1997, Patriarch Alexy put an anathema on self-avowed Patriarch Filaret. The curse was then endorsed by all other canonical Orthodox churches. 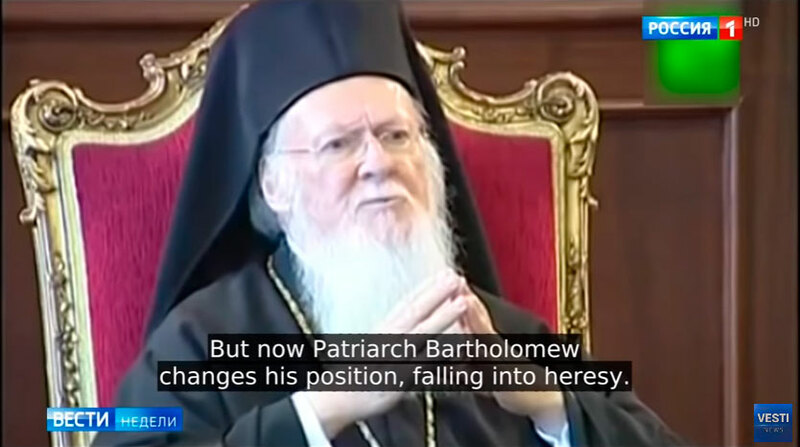 But now Patriarch Bartholomew changes his position, falling into heresy. History knows cases like that. In those moments, the Russian Orthodox Church ran independently. Metropolitan Hilarion: "Sometimes, the Russian Orthodox Church is accused of proclaiming its own autocephaly, because the election of Metropolitan Iona of Moscow in the middle of the 15th century happened without the consent of the Patriarch of Constantinople. But how could Rus' get the consent of the Patriarch of Constantinople when he was in Union, in heresy? He sent here a metropolitan who was talking about a Roman pope. He was later ousted and became a cardinal within the Roman Catholic Church. So these claims to being the first in honour, as well as to special rights and privileges are unsubstantiated." The Russian Orthodox Church is now pulling no punches and threatening to take countermeasures. All of this is really sad. The real sentiment of the majority of Orthodox Christians in Ukraine can be inferred from a statement of Metropolitan Luka of Zaporozhye and Melitopol. He compares these events to the Great Schism of 1054 when Christianity split into Catholics and Orthodox. Metropolitan Luka of Zaporozhye and Melitopol: "The statements of Patriarch Bartholomew of Constantinople threaten to repeat the 1054 Great Schism of the Christian Church. The consequences of such divide today can be even more horrible. Patriarch of Constantinople, by the way, is a citizen of a Muslim country, and by taking action that extends far beyond its borders, he tries to go beyond being the first among equals and become the head of the entire church, essentially displacing its true head, Jesus Christ, and becoming another Roman pope. It's easy to see that the attempts to create an Eastern pope provoke disagreements and disunion inside Orthodoxy, and instead of uniting all autocephalous churches under one omophorion, His All Holiness Bartholomew tears apart the seamless robe of Jesus, not reinforcing it."